Point-to-Point Protocol over Ethernet (PPPoE) is a specification for connecting multiple computer users on an Ethernet Local Area Network (LAN) to a remote site through common user's premises equipment, which is the telephone company's term for a modem and similar devices. PPPoE can be used to have an office or building full of users that share a common Digital Subscriber Line (DSL), cable modem, or wireless connection to the Internet. Most DSL providers use PPPoE to establish Internet connections for end-users. 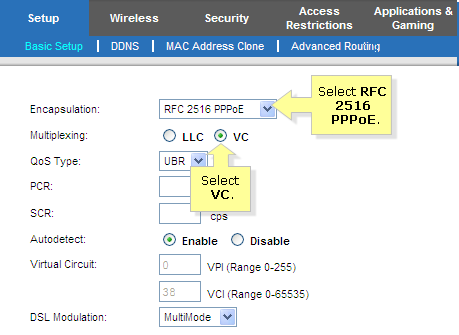 To set up a Linksys router, you need to enable PPPoE on the router's web-based setup page. Before setting up the Linksys ADSL Gateway, make sure that the Internet connection is active. If not, contact your Internet Service Provider (ISP). Once done, proceed with connecting the devices together. Connect the ADSL line and computer to the gateway. For instructions, click here. Check the LEDs that are lit on the gateway. For instructions, click here. NOTE: The images below may vary, depending on the device model you are using. Access the gateway's web-based setup page. For instructions, click here. If you are using a Mac® computer to access the web-based setup page, click here. Under the Basic Setup sub-tab, look for Encapsulation and select RFC 2516 PPPoE on the dropdown arrow. Select the appropriate setting for Multiplexing. In the example below, VC is selected. NOTE: ISPs provide the type of Multiplexing to use for the connection that you have. For a list of ISP settings per region, click here. 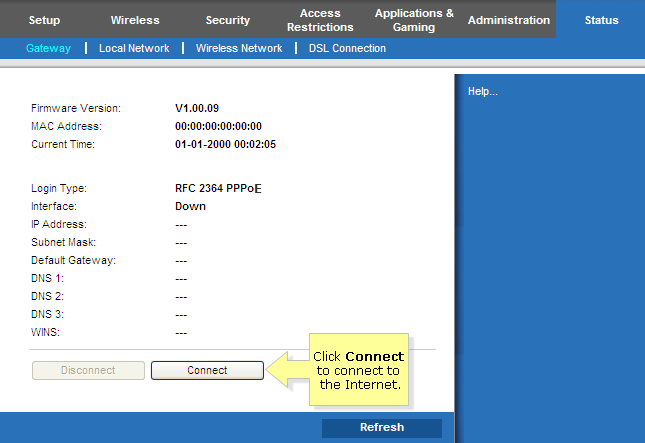 If your screen is different from the one below, look for PPPoE on the first dropdown. 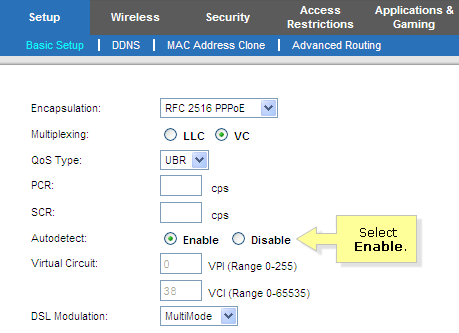 Set Autodetect to Disable and under Virtual Circuit, enter the VCI and VPI values provided by your ISP. 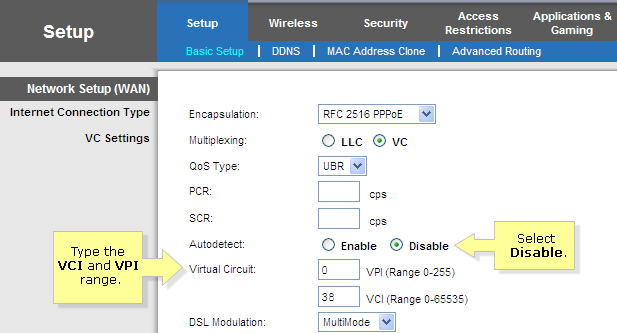 NOTE: Virtual Path Finder (VPI) and Virtual Circuit Identifier (VCI) are very important information that you need to enter to get a DSL modem working. If you don’t have this information, you may contact your ISP for details. If your ISP didn't provide the Virtual Circuit information, set Autodetect to Enable. In the User Name and Password fields, enter the username and password provided by your ADSL ISP. If necessary, include a domain in the User Name such as yourusername@isp.net. On the Internet Connection section, click Connect to connect to the Internet. NOTE: There is no Internet connection if the IP Address, Subnet Mask, Default Gateway, DNS 1, DNS 2 and DNS 3 are empty. If this occurs, you can powercycle the gateway or contact your ISP for assistance.